I. Using information on the evolution of genes to improve phylogenetics. II. Using phylogenies to understand the origin, spread and maintenance of biological diversity. 1) The Impact of life history evolution on speciation. I chose to study year classes of 13- and 17-year periodical cicadas, because adults appear in different years and thus were believed to be reproductively isolated incipient species. My group discovered that year classes of each species of periodical cicada are for the most part independently evolving units (Simon 1983) with geographic integrity (Simon 1979; Archie, Simon and Wartenburg 1985); however, there are locations were there has been gene flow between year classes associated with life-cycle shortening that can be either temporary (Simon and Lloyd 1982; Lloyd, Simon and Kritsky 1983) or permanent (Martin and Simon 1988, 1990a). We produced evidence to suggest that ecological factors such as competition of juveniles underground and clustering of adults in time and space also had a strong influence on evolution (Simon, Karban, and Lloyd 1981; Simon 1988; Martin and Simon 1990; Heliovaara, Vaisanen and Simon 1994; Williams and Simon 1995). We also demonstrated that likely changes in life history have led to the formation of new species ("allochronic speciation"; Simon et al. 2000) and that genetic change has been facilitated by critical changes in acoustic behavior (courtship signals) (Cooley et al. 2001, 2003; Marshall, Cooley and Simon 2003; Marshall et al. 2003, Cooley et al. 2006). We are currently collaborating with geneticists and theoreticians in Japan to increase our understanding of these life history changes and their relationship to periodical prime-numbered life cycles (Yoshimura et al. 2009, Tanaka et al. 2009). Work with Teiji Sota suggests that not only13-year cicadas but also 17-year cicadas living today have evolved at least twice by life cycle switching on a massive scale. In addition, our periodical cicada work has demonstrated the asymmetrical nature of gene flow between species (Fontaine, Cooley and Simon 2007). We also continue to explore the interaction of climatic and human-caused landscape changes on present day periodical cicada distributions (Cooley et al. 2004, 2009). We are currently collaborating with Spencer Johnston and his student Shawn Hanrahan of Texas A&M University to size the genomes of all periodical cicada species. We have nominated a 13-year cicada for whole genome sequencing as part of the i5K 5,000 insect-genome project and hope soon to compare the complete nuclear genomes of a 13- and 17-year cicada to start unraveling the genetics of life cycle change. 2) The Impact of landscape/climate change on speciation. I have focused on island endemic species because insular evolution is simplified and often accelerated compared to continental systems. We can therefore study the complete history of all species throughout their respective ranges and sample many different climatic regimes and ecosystems in a reasonable time frame. I studied island evolution in Hawaiian insects (Carson et al. 1982, Simon et al. 1984, Simon 1987) and continued this work at UConn with my PhD student Steve Jordan (Jordan et al. 2003, 2005, 2007). 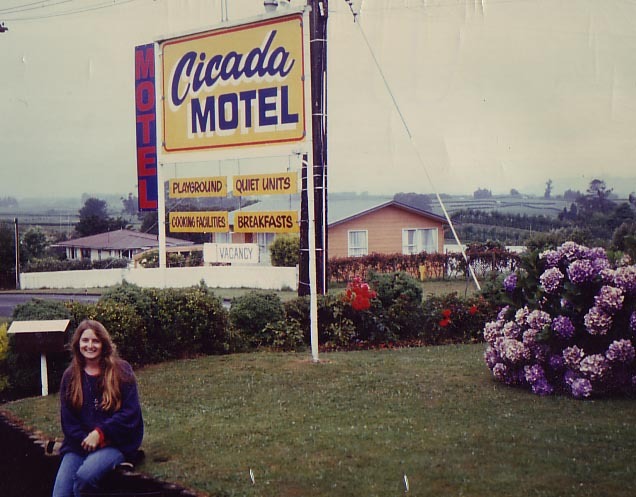 I began parallel work in New Zealand after learning of a large radiation of NZ cicadas occupying nearly every available climatic/vegetational zone. New Zealand's well-studied and dramatic landscape and climate changes make this system ideal for exploring the impact of physical changes on speciation. We have now studied the molecular evolution, courtship songs, and ecology of every one of the 60 taxa of NZ cicadas throughout each of their geographic ranges (Arensburger et al. 2004a; Buckley et al. 2001a, b, c, 2006; Buckley and Simon 2007; Marshall et al. 2008, 2009, in press., Simon et al. 2009; Hill et al. 2009). We traced the origin of NZ genera to Australia (Buckley et al. 2002; Arensburger et al. 2004b), and discovered that all of the diversity we see today in NZ arose in the last 10-15 Ma. Two pulses of diversification occurred in association with mountain building followed by more-or-less steady diversification throughout the ice ages (ca. 2 Myr). Based on courtship song, combined with DNA and morphological evidence, we estimate time to speciation at ca. one to two million years. Peer Reviewed Journal Articles *= undergraduate researchers. Simon, C.M. 1979. Evolution of periodical cicadas. I: Phylogenetic inferences based on allozymic data. Syst. Zool. 28:22-39. Simon, C.M. 1979. Brood II of the 17-year cicada on Staten Island: timing and distribution. Proc. Staten Island Institute Arts and Science 30(2):35-46. Levinton, J.S., and C.M. Simon. 1980. A critique of the punctuated equilibria model and implications for the detection of speciation in the fossil record. Syst. Zool. 29:130-142. Simon, C.M., R. Karban, and M. Lloyd. 1981. Patchiness, mean crowding and relative density of allochronic, sympatric populations of 17-year cicadas. Ecology 62:1525-1535. Carson, H.L., F.C. Val, C.M. Simon, and J.W. Archie. 1982. Morphometric evidence for incipient speciation in Drosophila silvestris from the Island of Hawaii. Evolution 36:132-140. Simon, C.M., W.A. Steffan, W.W. Moss, and N.A. Evenhuis. 1982. The genus Toxorhynchites: Numerical phylogenetic analysis of T. splendens and allies. Mosq. Syst. 14(4):221-254. Simon, C.M. 1983. Morphological differentiation in wing venation among broods of 13- and 17-year periodical cicadas. Evolution 37:104-115. Lloyd, M., G. Kritsky, and C.M. Simon. 1983. A simple genetic model for life cycles of 13- and 17-year periodical cicadas with historical evidence of hybridization between them. Evolution 37:1162-1180. Simon, C.M., W.C. Gagne', F.C. Howarth, and F.J. Radovsky. 1984. Hawaii: A natural entomological laboratory. Bull. Ent. Soc. Amer. 30(3):8-17. Simon, C.M., and J.W. Archie. 1985. An empirical demonstration of the lability of heterozygosity estimates. Evolution 39(2): 463-467. Archie, J.W., C.M. Simon, and D. Wartenburg. 1985. Patterns of geographic variation in allozymes of 10 broods of periodical cicadas: spatial autocorrelation. Evol. 39:1261-1274. Simon, C.M. 1987. Hawaiian Evolutionary Biology: An Introduction. TREE 2(7): 175-178. Simon, C.M. 1988. Evolution of 13- and 17-year Periodical Cicadas. (Homoptera: Cicadidae: Magicicada). Bull. Entomol. Soc. Amer. 34: 163- 176. Martin, A.P. and C.M. Simon. 1988. Anomalous distribution of nuclear and mitochondrial DNA markers in periodical cicadas. Nature 336: 237-239. Archie, J., C. Simon, and A. Martin. 1989. Small sample size does decrease the stability of dendrograms calculated from allozyme frequency data. Evol. 43:678-683. Martin, A. and C. Simon. 1990. Differing levels of among-population divergence in the mitochondrial DNA of 13- versus 17-year periodical cicadas related to historical biogeography. Evolution 44(4): 1066-1088. Martin, A. and C. Simon. 1990. Temporal variation in insect life cycles and its evolutionary significance: Lessons from periodical cicadas. BioScience May:359-367. Simon, C., C. McIntosh*, and J. Deniega*. 1993. Standard restriction fragment length analysis of the mitochondrial genome is not sensitive enough for phylogenetic analysis or identification of 17-year cicada broods: The potential for a new technique. Annals of the Entomological Society of America 86:142-152. Simon, C., F. Frati, A. Beckenbach, B. Crespi, H. Liu, and P. Flook. 1994. Evolution, weighting, and phylogenetic utility of mitochondrial gene sequences and a compilation of conserved PCR primers. Annals Entomol. Soc. Am. 87: 651-701. **Note: The above paper is a "Citation Classic." Essential Science Indicators (a branch of ISI, Web of Science), featured this paper on its website. Heliovaara, K., R. Vaisanen, and C. Simon. 1994. The evolutionary ecology of insect periodicity. Trends in Ecology and Evolution 9: 475-480. Williams, K. S. and C. Simon. 1995. The Ecology, behavior, and evolution of periodical cicadas. Annual Review of Entomology 40: 269-295. Sullivan, J., K. Holsinger, and C. Simon. 1995. Among-site rate variation and phylogenetic analysis of the 12S rRNA in Sigmodontine Rodents. Molecular Biology and Evolution 12:988-1001. Phillips, A.J. and C. Simon. 1995. Simple, efficient, and nondestructive DNA extraction protocol for Arthropods. Ann. Entomol. Soc. Am. 88: 281-283. Hickson, R., C. Simon, A. Cooper, G. Spicer, J. Sullivan and D. Penny. 1996. Conserved sequence motifs, alignment, and secondary structure for the third domain of animal 12S rRNA. Molecular Biology and Evolution 13: 150-169. Sullivan, J., K. E. Holsinger, and C. Simon. 1996. The effect of topology on estimates of among-site rate variation. J. Molecular Evolution 42: 308-312. Simon, C., L. Nigro, J. Sullivan, K. Holsinger, A. Martin, A. Grapputo, A. Franke, and C. McIntosh. 1996. Large differences in substitutional pattern and evolutionary rate of 12S ribosomal RNA genes. Mol. Biol. Evol. 13: 923-932. Gogarten, J.P., L. Olendzenski, E. Hilario, C. Simon, and K.E. Holsinger. 1996. Dating the Cenancester of Organisms. (Technical Comment on Doolittle's dating of the origin of early life: accounting for horizontal transfer and among site rate variation.) Science 274:1750-1751. Frati, F., C. Simon, J. Sullivan, and D. Swofford. 1997. Gene evolution and phylogeny of the mitochondrial cytochrome oxidase gene in collembola. J. Molecular Evolution 44:145-158. Henry, C.S., M.L.M. Wells, and C.M. Simon. 1999. Convergent evolution of courtship songs among cryptic species of the carnea-group of green lacewings (Neuroptera: Chrysopidae: Chrysoperla). Evolution 53(4): 1165-1179. Carapelli, A., F. Frati, F. Nardi and C. Simon. 1999. Molecular phylogeny of the Apterygotan Insects based on nuclear and mitochondrial genes. Proceedings of the Vth International seminar on Apterygota, University of Cordoba, Cordoba, Spain, 1998. Pedobiologica. Hickson, R.E.. C. Simon, and S.W. Perrey. 2000. The performance of several multiple sequence alignment in relation to secondary structure features for an RNA sequence. Molecular Biology and Evolution 17(4):530-539. Simon, C.M., J. Tang, S. Dalwadi*, G. Staley*, J. Deniega*, and T.R. Unnasch. 2000. Genetic evidence for assortative mating between 13-year cicadas and sympatric "17-year cicadas with 13-year life cycles" provides support for allochronic speciation. Evolution 54:1326-1336. **Note: The above article was highlighted in articles in: 1) New Scientist, 17 July 99; 2) Science News, 24 June 2000; 3) "Editor's Choice" section of SCIENCE magazine, Sept 1, 2000; and 4) Trends in Ecology and Evolution, February 2001. Buckley, T. R., C. Simon, P. K. Flook and B. Misof 2000. Secondary structure and conserved motifs of the frequently sequenced domains IV and V of the insect mitochondrial large subunit rRNA gene. Insect Molecular Biology 9(6), 565-580. Buckley, T.R., C. Simon, and G.K. Chambers. 2001. Exploring among-site rate variation models in a maximum likelihood framework using empirical data: the effects of model assumptions on estimates of topology, branch lengths, and bootstrap support. Systematic Biology 50:67-86. Cooley, J.R., C. Simon, D. C. Marshall, K, Slon and C. Ehrhardt*. 2001. Allochronic speciation, secondary contact, and reproductive character displacement in periodical cicadas (Hemiptera: Magicicada spp. ): Genetic, morphological, and behavioral evidence. Molecular Ecology 10: 661-671. Buckley, T.R. C. Simon, H. Shimodaira, and G. K. Chambers. 2001. Evaluating hypotheses on the origin and evolution of the New Zealand alpine cicadas (Maoricicada) using multiple comparison tests of tree topology. Molecular Biology and Evolution 18(2): 223-234. Artiss, Thomas, Ted R. Schultz, Dan A. Polhemus, and Chris Simon. 2001. Molecular Phylogenetic Analysis of the Odonate Genera Libellula , Ladona and Plathemis (Odonata: Libellulidae) Based on Mitochondrial Cytochrome Oxidase I and 16S rRNA Sequence Data. Molecular Phylogenetics and Evolution 18: 348-361. Buckley, T.R., C. Simon, and G.K. Chambers. 2001. Phylogeography of the New Zealand cicada Maoricicada campbelli based on mitochondrial DNA sequences: Ancient clades associated with Cenozoic environmental change. Evolution 55:1395-1407. Buckley, T.R., P. Arensburger, C. Simon, and G.K. Chambers. 2002. Combined Data, Bayesian Phylogenetics, and the Origin of the New Zealand Cicada Genera. Systematic Biology 51(1): 4-18. Schauber EM, Kelly D, Turchin P, Simon C, Lee WG, Allen RB, Payton IJ, Wilson PR, Cowan PE, Brockie RE. 2002. Synchronous and asynchronous masting by 18 New Zealand plant species: the role of temperature cues and implications for climate change. Ecology 83: 1214-1225. Jordan, S., C. Simon, and D. Polhemus. 2003. Molecular Systematics and Adaptive Radiation of Hawaii's Endemic Damselfly Genus Megalagrion. Systematic Biology 52(1): 89-109. Marshall, D. C., J. R. Cooley, and C. Simon. 2003. Holocene climate shifts, life-cycle plasticity, and speciation in periodical cicadas: A comment and reply to Cox and Carlton. Evolution, 57:433-437. Cooley, J. R., C. Simon, and D. C. Marshall. 2003. Temporal separation and speciation in periodical cicadas. BioScience, 53: 151-157. Saux, Corrie, C. Simon, and G.S. Spicer. 2003. Phylogeny of the Dragonfly and Damselfly Order Odonata as Inferred by Mitochondrial 12S Ribosomal RNA Sequences. Ann. Entomol. Soc. Am.96(6): 693-699. Arensburger, P., T.R. Buckley, C. Simon, M. Moulds and K. E. Holsinger. 2004. Biogeography and phylogeny of the New Zealand Cicada Genera (Hemiptera: Cicadidae) based on nuclear and mitochondrial DNA data. Journal of Biogeography 31: 557-569. Carapelli, A., F.N. Soto-Adames, C. Simon, F. Frati, F. Nardi, and R. Dallai. 2004. Secondary structure, high variability, and conserved motifs for domain III of 12S rRNA in the Arthropleona (Hexapoda; Collembola). Insect Molecular Biology 13:659-670. *Jordan, S., C. Simon, D. Foote, and R.A. Englund. 2005. Phylogeographic patterns of Hawaiian Megalagrion damselflies (Odonata: Coenagrionidae) correlate with Pleistocene island boundaries. Molecular Ecology 14: 3457-3470. Cooley, J.R., D. Marshall, K.B.R. Hill and C. Simon. 2006. Reconstructing asymmetrical reproductive character displacement in a periodical cicada contact zone. Journal of Evolutionary Biology 19: 855-868. Buckley, T.R., M. Cordeiro, D.C. Marshall, and C. Simon. 2006. Differentiating between hypotheses of lineage sorting and introgression in New Zealand alpine cicadas (Maoricicada Dugdale). Systematic Biology 55:411-425. Simon, C., T.R. Buckley, F. Frati, J. Stewart, and A. Beckenbach. 2006. Incorporating molecular evolution into phylogenetic analysis, and a new compilation of conserved polymerase chain reaction primers for animal mitochondrial DNA. Annual Review of Ecology, Evolution, and Systematics. 37:545-579 + 45 pages of on-line supplement. Marshall, D,C., C. Simon, and T.R. Buckley. 2006. Accurate Branch Length Estimation in Partitioned Bayesian Analyses Requires Accommodation of Among-Partition Rate Variation and Attention to Branch Length Priors. Systematic Biology 55: 993-1003. Buckley, T.R. and C. Simon. 2007. Evolutionary radiation of the cicada genus Maoricicada and the origins of the New Zealand alpine biota. Biological Journal of the Linnean Society 91:419-435. Sueur, Jerome, Dan Vanderpool, Chris Simon, David Ouvrard, and Thierry Bourgoin. 2007. Molecular phylogeny of the genus Tibicina (Hemiptera, Cicadidae): rapid radiation and acoustic behaviour. Biological J. Linnean Society. 91: 611-626. Jordan, Steve, Emilie Barruet*, Mark Olaf*, Barbara Parsons, and Chris Simon. 2007. Blue hawaiiense and beyond: conservation genetics and comparative phylogeography of four Hawaiian Megalagrion damselfly species (Odonata: Coenagrionidae). In Biology of Hawaiian Streams and Estuaries. N.L. Evenuis amd J.M. Fitzsimons (Eds.) Bishop Museum Bulletin in Cultural and Environmental Studies 3: 247-260. Marshall, D.C., K. Slon, J.R. Cooley, Kathy B.R. Hill, and Chris Simon. 2008. Steady Plio-Pleistocene diversification and a 2-million-year sympatry threshold in a New Zealand cicada radiation. Molecular Phylogenetics and Evolution 48(3): 1054-1066. Hill, K.B.R., C. Simon, D.C. Marshall, and G.K. Chambers. 2009. Surviving Glacial Ages within the Biotic Gap: Phylogeography of the New Zealand cicada Maoricicada campbelli. Journal of Biogeography 36: 675-692. Cooley, J.R., G. Kritsky, J.D. Zyla, M.J. Edwards, D.C. Marshall, K.B.R. Hill, R. Krauss, and C. Simon. 2009. The distribution of Periodical Cicada Brood X. American Entomologist 55(2): 106-112. Marshall, D. C., Hill, K. B. R., Fontaine, K., Buckley, T., and Simon, C. 2009. Glacial refugia in a maritime temperate climate: Cicada (Kikihia subalpina complex) mtDNA phylogeography in New Zealand. Molecular Ecology 18: 1995-2009. Tanaka, Yumi, Jin Yoshimura, Chris Simon, John R. Cooley, and Kei-ichi Tainaka. 2009. Allee effect in the selection for prime-numbered cycles in periodical cicadas. Proceeding of the National Academy of Sciences (USA) 106 (22): 8975-8979. Simon, C. 2009. Using NZ examples to teach Darwin's "Origin of Species:" Lessons from Molecular Phylogenetic Studies of Cicadas. New Zealand Science Review 66 (3): 102-112. Marshall, D. C., Hill, K. B. R., Simon, C., and J. Cooley. 2011. Hybridization, Mitochondrial DNA Phylogeography, and the Prediction of Early Stages of Reproductive Isolation: Lessons from New Zealand cicadas of the Genus Kikihia. Syst. Biol. 60(4): 482-502. Cooley, John R., Gene Kritsky, Marten J. Edwards, John D. Zyla, David C. Marshall, Kathy B. R. Hill, Gerry Bunker, Mike Neckermann, Roy Troutman, Jin Yoshimura, and Chris Simon. 2011. Periodical cicadas (Magicicada spp. ): A GIS-based map of Broods XIV in 2008 and "XV" in 2009. American Entomologist. Scheduled for publication Fall 11.